Preparar los chicharrones y desmenuzarlos un poco. Asar los plátanos pelados y cuando estén cocidos aplastarlos hasta formar una papilla. Prepare your pork pieces. 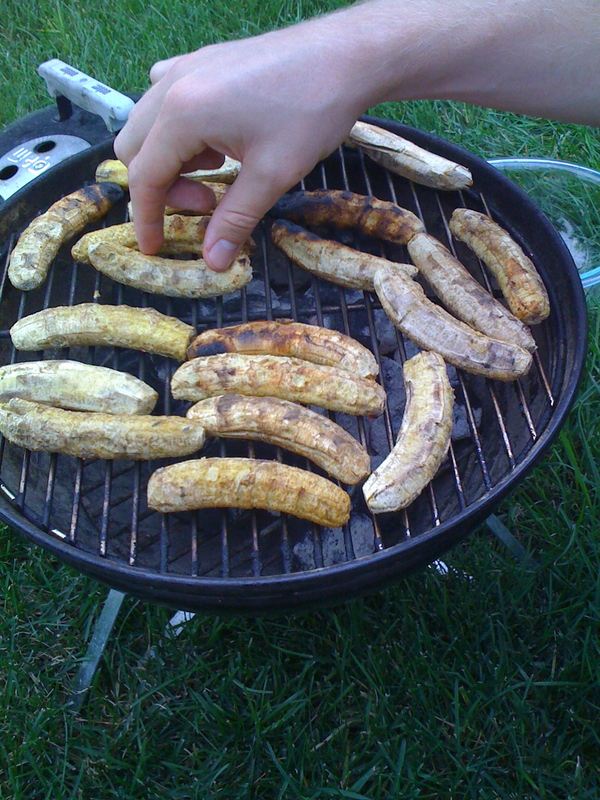 Grill the peeled bananas and when they are cooked, smash them to a pulp. Mezclar la carne con los plátanos, agregar la manteca y sazonar con sal. We made it with our friend Matt the other day. Rainbow Food didn’t have normal Plantain Bananas, so we had to use the little ones. Matt broke our smasher. Thanks Matt. 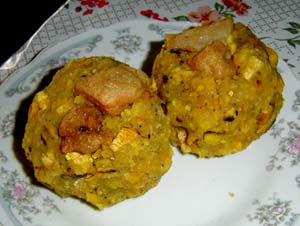 When we ate it we added a fried egg on top of the final ball of banana. We had a great time passing time with our friends. Whether we were cooking a meal (or watching one being cooked), walking through the city, or just sitting around, we were blessed to be with them. Cooking on the roof at the Huaman’s. One of our favorite things to do with our Peruvian family and friends is to play games. We played Uno, Dos, SkipBo, Pass the Pigs, Dutch Blitz, Pictionary Telephone, Storytime, basketball (21, around the world, Chancho), and soccer. We played “Chancho” – the spanish version of Pig with Tito and Paola. In South America it is common to see a Loza in every neighborhood, a cement pad marked for Basketball, Volleyball, and Soccer. It is normally the center of the community for sports and recreation. Kimberly’s favorite phrase during Uno: “La venganza es dulce.” You can google that one if you are interested. One big difference we saw while on this last trip was the new church building in Musa. A few months before we left Peru in 2008 the church began the demolition of the old building. Because of poor construction and dangerous conditions, the church building needed to be rebuilt. As we entered Musa three years later we were able to see the fruits of their labor. The church now has the sanctuary on the first floor (allowing the elderly to participate), better lighting, and more space. The second floor is another open area large enough to have Jovenes meetings, Bible studies, or group Sunday School classes. It also contains the pastor’s office and nursery area. The third floor is the pastor’s home, which has three bedrooms, a kitchen, one bathroom, and a dining room/living room area. This was especially helpful since someone was around at all times (in a culture where an unguarded house is open game for any thief). The fourth floor has several more rooms, a kitchen for the church, and a laundry area. We are thankful for all the brothers and sisters in Christ who gave of their time, money, and effort to see this new church building realized. We just got back from a two week trip to Perú. We did not go to see Machu Picchu. We did not fly to Iquitos to float in the Amazon. We did not go to the beach to surf. We went to see our friends and adopted families in Lima. We spent two weeks visiting in the homes of our friends and family. Our goal was to encourage others through our presence, conversations, and actions to love Christ more. In turn we were encouraged to love Christ and others through the example of those we visited. We praise God for these brothers and sisters in Christ whom He has placed in our lives. 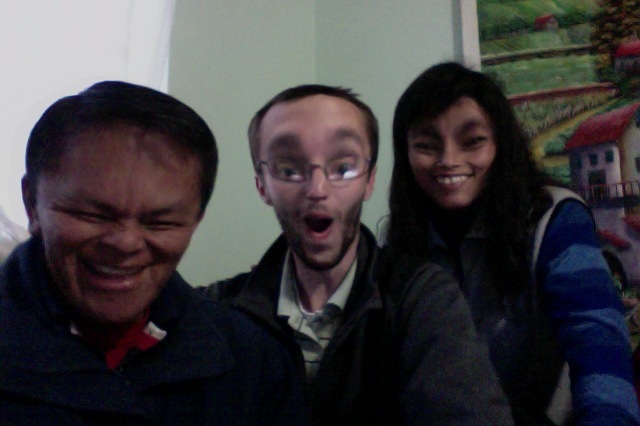 Over the next few weeks we hope to post more pictures of those who we were able to visit, the great food they fed us, and even some of the funny pictures we took with Photobooth. …this will make sense to you. Marca Perú – ¡Ustedes tienen derechos! Travel Status – We are back in Brainerd, MN, and it doesn’t seem real. The past nine months have been a whirlwind of exciting, testing, and learning times. We truly thank God for all that He has done in us these past months. He is to be praised. Future Schedule – We will be heading to North Dakota and then Montana for the next two weeks, and then back to Brainerd. Starting in July we hope to begin looking for a church, apartment, and jobs in Minneapolis. We will be starting our Master’s programs this August at Central Theological Seminary in Plymouth, MN. Crystal will be pursuing her Master’s of Counseling and Seth will be pursuing his Master’s of Divinity. These past few months have deeply ingrained in our minds the absolute necessity of continued studies, and we believe that the next step the God has for us is studying at Central. Prayer Requests – We want to praise God for 1. all that He has taught us these past nine months, 2. His great blessings of safety and health, 3. His abundant provision of our daily needs, 4. the friendships we were able to cultivate. We also request your prayers in regards to 1. Decisions regarding ministry plans in a local church, 2. Apartment and job searches, 3. Our future studies. The Peru Side – You never know what you really have until you don’t have it. When a part of your everyday life is suddenly taken from you, there is a void there that continues to remind you of what you lack. On returning to the States we were able to see that void once again filled. There are no drinking fountains in Peru. Drink up. Renato and Nordid Huaman took Crystal and I out for a ride around Lima. We took in some beautiful sights down by the ocean. Renato also showed us the police station where he works and the patrol car he uses. His job involves 24 hour shifts, one day on, one day off. On his days off he works as a money changer. The Huaman family came over for lunch on Sunday afternoon. Crystal has made a lot of different foods with them so (1.) 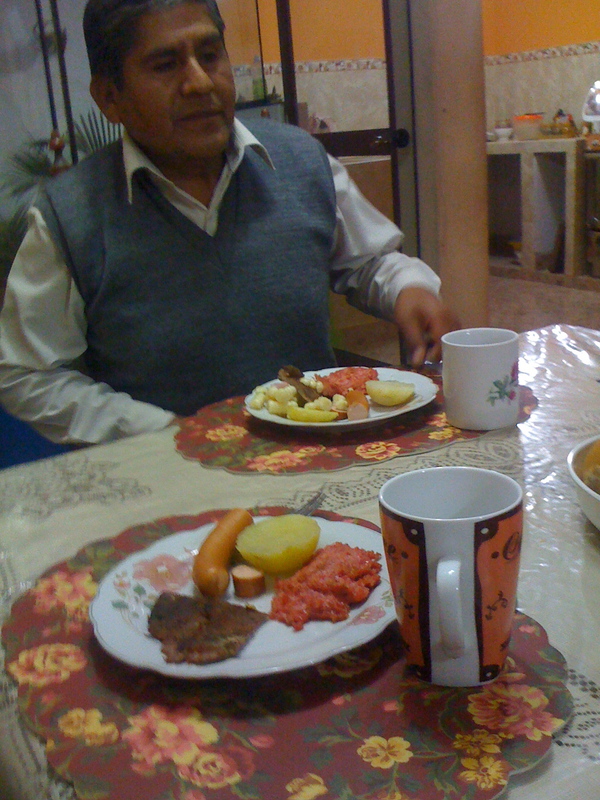 she can learn how to make Peruvian dishes and (2.) they can learn how to make North American dishes. 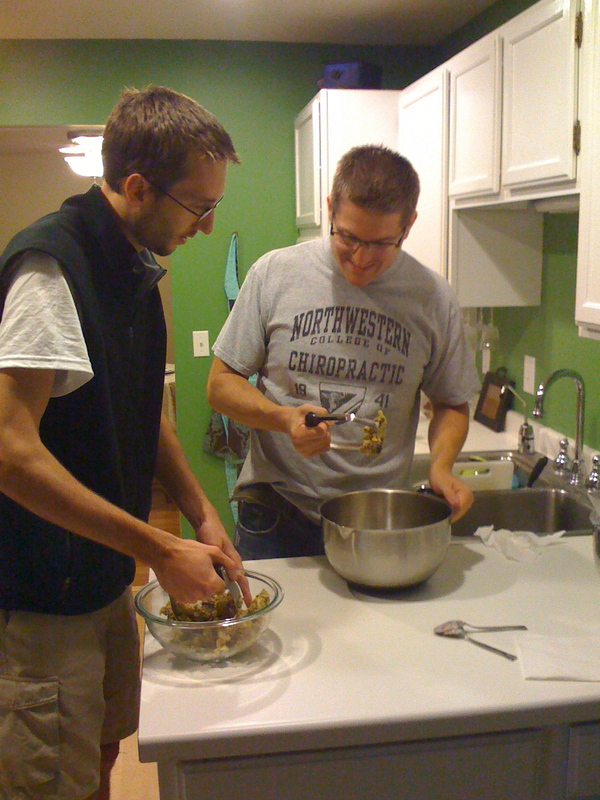 While they were cooking, Tito and I played tops. That is how we “helped.” It is safer that way. and a good nap followed. We have enjoyed spending time with our families, and God has truly blessed us through them.